Scalable Vector Graphics (SVG) is an open, industry-standard XML-based format for vector graphics developed by the W3C. Its acceptance is growing fast. Most vector editors these days can import and export SVG, and modern browsers (such as Firefox and Opera) can display it directly, i.e. without requiring any plugins. InkScapes open source vector graphics editor, with capabilities similar to Illustrator, CorelDraw, or Xara X, uses the W3C standard Scalable Vector Graphics (SVG) file format. However it can also output a lot of files like BMP, GIF, JPG, PNG and more! 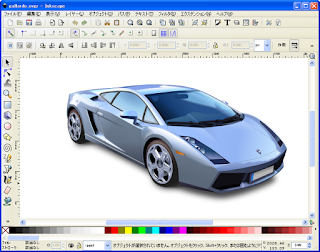 In contrast to raster (bitmap) graphics editors such as Photoshop or Gimp, Inkscape stores its graphics in a vector format. Vector graphics is a resolution-independent description of the actual shapes and objects that you see in the image. 4 Komentar untuk "Download Inkscape(software alternatif correl draw)"
Makasih sob udah share alternatif corel drawnya, apakah cara penggunaannya maupun toolsnya sama dengan corel draw? Ataukah berbeda?